Shortly after making a promise to their dying father to save their lands and their people from a corrupt king, Meliara and her brother, the Countess and Count of Tlanth, go to war. They know that their tiny force is outnumbered, out-armed and mostly untrained, but they have their wits, they know the terrain, and they have unwavering confidence in their mission: Honor and justice is on their side. Crown Duel is a rip-roarer of an adventure -- chases, captures, escapes, a torture chamber, lots of tree-climbing, secret allies, spies, gloomy dungeons, a stubborn (some might say pig-headed) heroine and more D&D-esque names than you could shake a stick at. Meliara's backstory is also an interesting one -- when was the last time you read about a teen heroine who'd only just learned to read and write the year before the action begins? 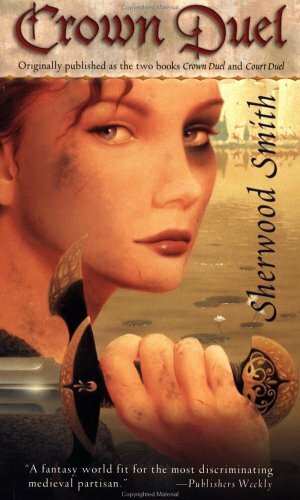 Random note: There were two moments that made me wonder if S. Smith is a big fan of The Blue Sword: The bath scene at the castle and the scene where she falls asleep in the windowseat. I'm very much looking forward to the second installment. Highly recommended to fans of the Plucky Heroine fantasy sub-genre, a la Tamora Pierce. And now, a complaint. But it's spoileriffic, so skip it if you'd like. Auuuuuuuuuuugh. I realize that Meliara hasn't read The Scarlet Pimpernel, what with the just learning how to read and the living in a different world, but I have. So I found myself irritated when she didn't get it about the Pimpernel-ish character, even after he'd saved her from big huge certain death -- twice. I realize that isn't really fair to Meliara, but, hey! That's just the way my brain works. Regardless of my lame issue, I'm way into reading the next one, probably this week. SDQ Interview with Erik P. Kraft.